This publication supercedes Harrison, J C; Thorsteinsson, R; Mayr, U; Lynds, T; Ford, A; Turner, E C; (2014). Geology, tectonic assemblage map of Wellington Channel, Cornwallis and western Devon islands, Nunavut, Geological Survey of Canada, Canadian Geoscience Map no. 33, ed. prelim. This publication is related to Harrison, J C; Lynds, T; Ford, A; Rainbird, R H; (2016). 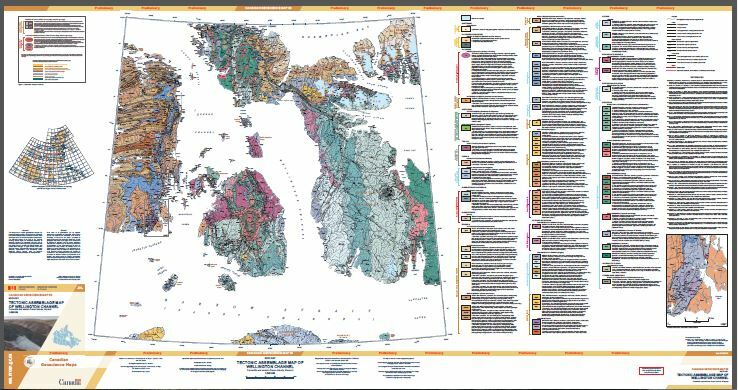 Geology, simplified tectonic assemblage map of the Canadian Arctic Islands, Northwest Territories - Nunavut, Geological Survey of Canada, Canadian Geoscience Map no. 80, ed. prelim. This map and the related geodatabase illustrate the bedrock geology of eastern Bathurst Island, Cornwallis and Little Cornwallis islands, and western Devon Island including Grinnell Peninsula and adjacent small islands. The dominant feature of the area is the northerly trending Boothia Uplift, the mobilized Ordovician to Devonian strata of the Cornwallis fold belt, and its intersection with the westerly trending Parry Islands fold belt. Uplift history is recorded by clastic wedges and related facies changes in upper Silurian and Lower Devonian strata. Unconformities occur beneath Lower Devonian, Carboniferous, and Cretaceous strata. Scattered Eocene igneous rocks of basanite-nephelinite-phonolite association are locally common. This map and the accompanying spatial files provide users with a flexible means of accessing the geology of the Canadian Arctic Islands. The present publication is one of fifteen collectively covering all of the Canadian Arctic Islands north and west of Baffin Island.